The second game in the supposed procession to the title takes place for the Americans on Monday and this time it is Venezuela who are the team that are expected to crumple before them. In all honesty, this is going to be another win for the American side with the only issue being the margin of victory for the Americans. Venezuela lost out in their opening game but they just need to get through this loss and then start thinking about getting points on the board in Group A.
Kevin Durant was the main points scorer for the US in their opening game, offering up 25 points in the crushing win over China. Kyrie Irving grabbed 12 points, Paul George provided 15 points and 17 points were offered up by DeMarcus Cousins. We all know that the US team have a range of players who can grab a lot of points which means that even if someone is having an off day, there will be other players that can take care of business. Gregory Echenique was the key player for the Venezuelan team in their opening game of the tournament and he managed to sink 12 points. 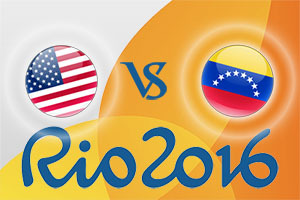 With the US continually looking to move forward, there may be an opportunity to get in behind them and cause some trouble so while it looks like being a large victory for the US side, the Venezuelans will be hoping to notch some points, which could create a platform for players like Echenique to add to their tally in the tournament. How many will USA win by? Okay, the Americans are going to win with a bit to spare and if they continue with a positive attitude and genuine frame of mind, they could do some damage. This is why you should look at backing the Americans at -51, which you can find at odds of 1.90. When it comes to the Over/Under market, look to go OVER 168.5, which you can grab at odds of 1.90. Bet Now! Most of the Prop bets for this game are Odd or Even bets but if you fancy betting on margin of victory in the 1st and 2nd quarter, you can. You can tip the USA side to win by 3 or more points at odds of 1.016 for the opening quarter, you can back Venezuela to win by 3 or more points at odds of 51.00 and all other bets are priced at odds of 11.50. For the second quarter, a US win by 3 or more points is priced at 1.045, a Venezuela win by 3 or more points is offered at odds of 36.00 and all other bets are available at odds of 8.50. This game starts at 2300 BST on Monday the 8th of August.